We are instrumental in designing and offering an industrially verified range of High Pressure Hydraulic Jacks that is ideal for maintenance, positioning, lifting and lowering applications. 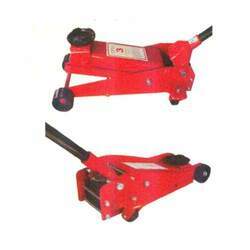 These jacks utilized in construction sites, mills, railway workshops and power plants for industrial maintenance. 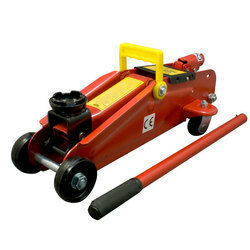 Front wheels with roller bearings and ball bearing mounted rear caster wheels provide stability and easy maneuverability. Heavy gauge steel side plates prevent twisting. High carbon steel side plates for increased chassis strength . Wide front wheels and ball bearing mounted rear caster wheels for stability and easy maneuverability. Two piece handle with knurled hand grip provides non-slip ease of pumping and longer reach under the vehicle.